Do you want an easy way to create your Joomla templates WITHOUT all the hassle? Or do you want to offer a service of making Joomla templates to your customers and easy make money with it? Here's a complete software solution and you DON'T need any HTML or PHP experience. 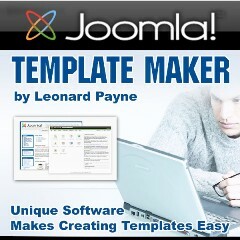 Template creation without even a knowledge of Dreamweaver, Frontpage or any other HTML editor. - Creates complete zip template package ready to upload within minutes. - Includes creation of valid XML file - You need to add NOTHING. It has never been easier to create your own great Joomla templates without any hassle!